Decades of deceit have been thrown overboard with the new nuclear sales pitch, argues JIM GREEN. The new sales pitch openly links nuclear power to weapons and argues that weapons programs will be jeopardised unless greater subsidies are provided for the civil nuclear industry. In 2015, Nuclear Monitor published a detailed analysis of the many ways nuclear industry insiders and lobbyists trivialise and deny the connections between nuclear power – and the broader nuclear fuel cycle – and nuclear weapons proliferation. The new sales pitch openly links nuclear power to weapons and argues that weapons programs will be jeopardised unless greater subsidies are provided for the civil nuclear industry. The US Nuclear Energy Institute, for example, tried in mid-2017 to convince politicians in Washington that if the only reactor construction projects in the US ‒ in South Carolina and Georgia ‒ weren’t completed, it would stunt development of the nation’s nuclear weapons complex. The Nuclear Energy Institute paper wasn’t publicly released. But in the second half of 2017, numerous nuclear insiders and lobbyists openly acknowledged power-weapons connections and called for additional subsidies for nuclear power. The most important of these initiatives was a paper by the Energy Futures Initiative ‒ a creation of Ernest Moniz, who served as energy secretary under President Barack Obama. Decades of deceit have been thrown overboard with the new sales pitch linking nuclear power and weapons. However there are still some hold-outs. Until recently, one nuclear lobbyist continuing to deny power-weapons connections was Michael Shellenberger from the ‘Environmental Progress’ pro-nuclear lobby group in the US. Shellenberger told an IAEA conference last year that “nuclear energy prevents the spread of nuclear weapons”. And he claimed last year that “one of FOE-Greenpeace’s biggest lies about nuclear energy is that it leads to weapons” and that there is an “inverse relationship between energy and weapons”. In two articles published in August, Shellenberger has done a 180-degree backflip on the power-weapons connections. “[N]ational security, having a weapons option, is often the most important factor in a state pursuing peaceful nuclear energy”, Shellenberger now believes. Poland, Hungary, and Finland are the only three nations (of the 26) for which Environmental Progress could find no evidence of weapons latency as a motivation. Current patterns connecting the pursuit of power and weapons stretch back across the 60 years of civilian nuclear power. Shellenberger notes that “at least 20 nations sought nuclear power at least in part to give themselves the option of creating a nuclear weapon” ‒ Argentina, Australia, Brazil, Egypt, France, Italy, India, Iran, Iraq, Israel, Japan, Libya, Norway, Romania, South Africa, Sweden, Switzerland, Taiwan, West Germany, Yugoslavia. Shellenberger asks why the deterrent effect of nuclear power isn’t being promoted as one of its many benefits. Nuclear weapons can have a deterrent effect ‒ in a uniquely dangerous and potentially uniquely counterproductive manner ‒ but any correlation between latent nuclear weapons capabilities and reduced military conflict is just that, correlation not causation. On the contrary, there is a history of military attacks on nuclear facilities to prevent their use in weapons programs (e.g. 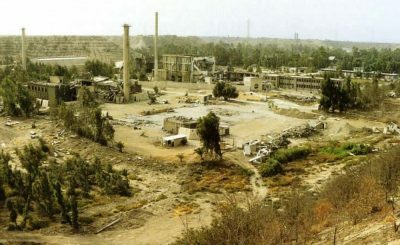 Israel’s attacks on nuclear facilities in Iraq in 1981 and Syria in 2007). Shellenberger points to the same problem, asking whether latency could “also be a threat to peace?” and noting Israeli and US threats to take pre-emptive action against Iran. He doesn’t offer an answer or explore the issue further. Shellenberger argues that Iran should be encouraged to develop nuclear weapons. He cites long-term nuclear weapons proliferation enthusiast Kenneth Waltz, who claims that the “decades-long Middle East nuclear crisis … will end only when a balance of military power is restored”. He cites a German academic who argues that a nuclear-armed Germany “would stabilize NATO and the security of the Western World”. We “should be glad that North Korea acquired the bomb” according to Shellenberger. And on it goes ‒ his enthusiasm for nuclear weapons proliferation knows no bounds. Nuclear Monitor has previously exposed the litany of falsehoods in Shellenberger’s writings on nuclear and energy issues. In his most recent articles he exposes himself as an intellectual lightweight prepared to swing from one extreme of a debate to the other if that’s what it takes to build the case for additional subsidies for nuclear power. Sam Seitz, a student at Georgetown’s Walsh School of Foreign Service, argues that Shellenberger’s argument is “almost Trumpian in its incoherence”. He takes issue with Shellenberger’s claims that no nuclear powers have been invaded (“a pretty misleading statistic” and “wrong”); that battle deaths worldwide have declined by 95% (“fails to prove that nuclear weapons are responsible for this trend … as we are frequently reminded, correlation and causation are not equivalent”); that Indian and Pakistani deaths in two disputed territories declined sharply after Pakistan’s first nuclear weapons test in 1998 (“doesn’t account for non-nuclear factors like the role of outside mediation and domestic politics”); and that Nazi Germany invaded France because the French lacked a credible deterrent (“makes very little sense and conflates several things … also silly”). No doubt there will be more acknowledgements of power-weapons connections by nuclear industry insiders and lobbyists. As Shellenberger notes, the nuclear ‘community’ today finds itself in an increasingly untenable position denying the connections. There is a degree of domestic support for nuclear weapons programs in weapons states … but few people support generalised nuclear weapons proliferation and few would swallow Shellenberger’s arguments including his call to shred the non-proliferation and disarmament system and to encourage weapons proliferation. The growing acknowledgement ‒ and public understanding ‒ of power-weapons connections might have consequences for nuclear power newcomer countries such as Saudi Arabia. Assuming that the starting point is opposition to a Saudi nuclear weapons program, heightened sensitivity might constrain nuclear exporters who would otherwise export to Saudi Arabia with minimalist safeguards and no serious attempt to check the regime’s weapons ambitions. Or it might not lead to that outcome ‒ as things stand, numerous nuclear exporters are scrambling for a share of the Saudi nuclear power program regardless of proliferation concerns.